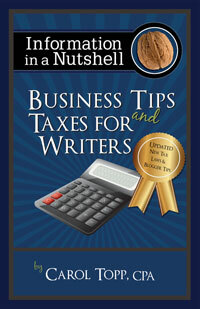 Here are some common tax deductions for writers. Are you taking them on your tax return? What can a writer deduct if he hasn’t sold a book yet? Can an author deduct any expenses if he hasn’t sold a book yet? Here are some common tax deductions for writers and bloggers. Writers, Don’t Forget These Tax Deductions! What can be deducted as “Other Expenses” for a writer? Are books donated to a school or library a tax deduction? A better idea than donating books. Did the 2017 Tax Bill Help or Hurt Writers? Are self publishing expenses tax deductible?